The Hawaiʻi Emergency Management Agency recommends individuals and families prepare an “emergency kit” with a minimum of 14 days’ worth of food, water and other supplies. For other tips and for more information, please visit dod.hawaii.gov/hiema . 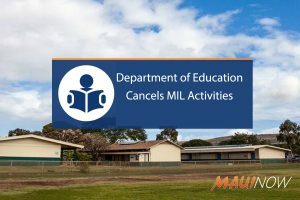 Updates on school closures will be posted on HIDOE’s website  and on social media -Twitter and Facebook, @HIDOE808, starting at 9 p.m. this evening.